THE PRIMITIVE OF A NEW ART. Superficially Cézanne’s art is pleasing, the glistening colours are clean and fresh, the meticulous line work looks impressive. His landscapes represent nature at its best and his brushwork implies order and reason behind the bucolic splendour of provincial France. Unfortunately Henry and Rose Pearlman didn’t collect any of Cézanne’s figurative works but the landscapes on view in this exhibition in Oxford are revealing enough to gain some sense of this artist’s mysterious alchemy. Because he was so delicate and considered in his colour and his network of lines, Cézanne’s paintings are widely appreciated throughout the world for their beauty. But the pleasure bestowed by looking at his paintings can mask the thinking man behind his vision. One look at one of his self-portraits (not present in this show) would be enough to demonstrate how deeply reflective this artist really was. Looking at the progression of his over twenty self portraits is to personally witness his growing self confidence and his wariness of prospective viewers. Walking around the Ashmolean you can see clearly his interest in the formal relationship between the geometry of buildings and the supple lines of their natural surroundings. It was not enough for him to simply paint fleeting moments like the Impressionists, no, his open, fragmented brushwork were subjected to a more ordered principle. However much Cézanne insisted upon the centrality of colour, drawing and form were never subservient in his art. The same paintings that are so subtly coloured often have a network of containing, defining lines above and below the surface pigment. It is always uplifting to see the precision in his drawings and the use of positioning lines are never more clear than in his Mont Ste Victoire watercolour. In this picture disparate and unrelated touches of coloured watercolour look at first glance like haphazard splishes and splashes of different colours covering the paper, but look closer and a narrative and unity appears that is not dissimilar to those fairytale painting completed by Kindinsky years later. Standing out above the other works in the second room of this collection is Cézanne’s magnificent Mont Ste Victoire, oil on canvas. When looking at this painting I was struck by the patience and deliberation that must have gone into making this work of art. The painstaking touches of colour, the vibrant greens and bright terracottas remain un-muddied despite their proximity to other colours. The lightness of parts of the painting like the sky and foreground is achieved by leaving parts of the canvas un-painted, a technique common to watercolours but not usually in oils. There is a puzzling horizontal line of blue in the sky which made me expect that this work was achieved by the use of deliberate, assured mark-making, no over painting of mistakes for Cézanne. Go right up to it and you can see that every revolution of modern art is there like a reverse palimpsest. Mondrian’s grids and outlines. Rhythmical patterns of colour like an un-dripped Jackson Pollock. Modernist abstraction. The pixelated screens of computer-generated imagery. He treasured his independence and isolation but towards the end of his life, slowed down by ill health, he drew comfort from his assimilation by a younger generation and looked forward to becoming ‘the primitive of a new art’. His famous remark “treat nature by means of the cylinder, the sphere and the cone” was famously followed by a new movement called Cubism. The Guardian’s art critic, Jonathan Jones has said, “every revolution of modern art is foretold. The urinal, the shark, the lights going on and off?” And I think he means that these are all example of art where the brain is engaged. 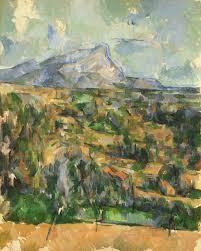 Cézanne is rightly lauded for the beauty of his work but is seldom recognised as the revolutionary he really was. He was an outsider who didn’t follow any school of thought but had his own independent vision. He was strong and authentic and doggedly kept true to his own personal perception of the world. He resisted the easy formula and truly believed that a painter, by means of drawing and colour, gives concrete form to his sensations and perceptions. Posted on June 16, 2014 June 16, 2014 Categories Art, Cezanne, Culture, France, Ideas, Nature, Painting, Post Impressionsim, Province, writingTags Art, art criticism, Cezanne, Culture, France, ideas, nature, painting, Province4 Comments on THE PRIMITIVE OF A NEW ART.